Before the outbreak of WWI, European countries were stipulating pacts and agreements, one of them was the Triple Entente. 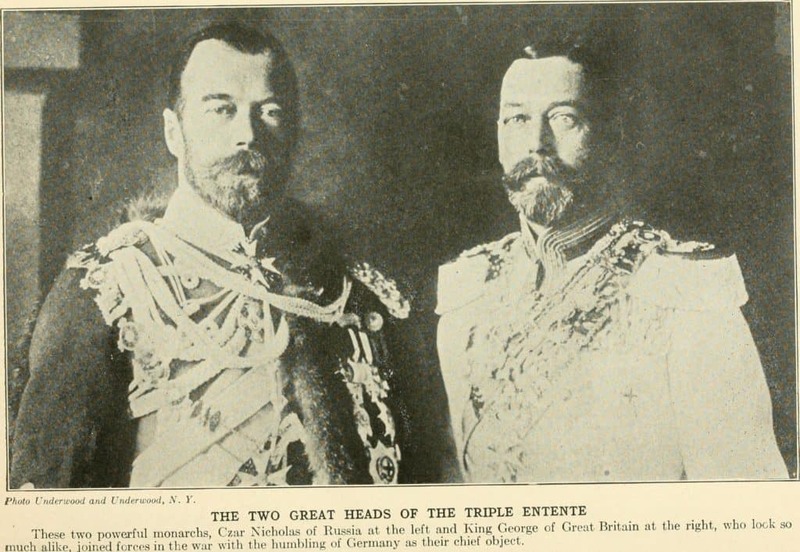 The Triple Entente was a pact between the British Empire, France, and Russia. Throughout the war, Italy deserted its alliance with Germany and the Austro-Hungarian Empire in order to join the Entente with the UK, France and Russia. Following the unification of Germany, Bismarck diplomatically isolated France in order to avoid France’s vengeance as a consequence of the Franco-Prussian War (1870-71). 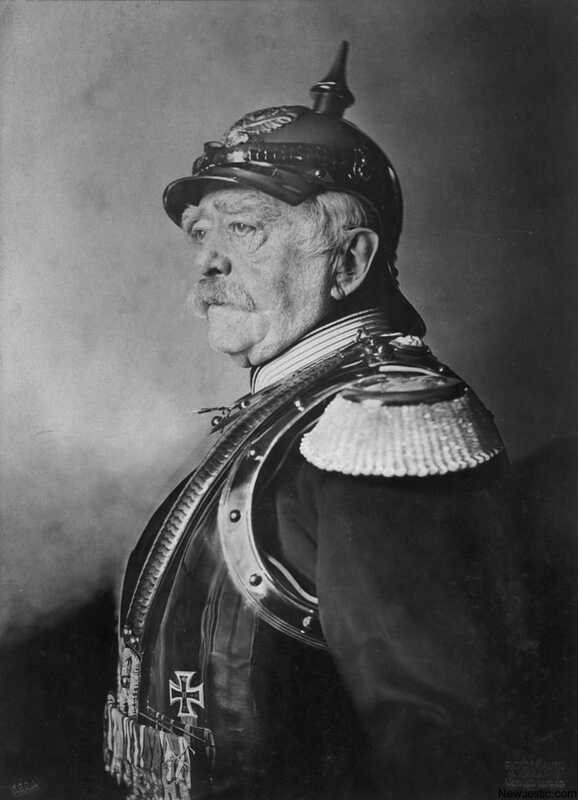 Otto von Bismarck (1815-1898) was the prime minister of Prussia and the first chancellor of the German Empire. For around twenty years, he was actively engaged in maintaining a state of peace in Europe and ‘skilfully pursued pacific policies in foreign affairs’ (Barkin no date). Throughout 1862 to 1871, Bismarck was able to succeed military and ‘form a German state out of several principalities’ (Wilde 2018). However, the German Chancellor was afraid that the neighbouring nations would plot against the German unification and attempt to destroy their newborn nation (Wilde 2018). Therefore, the first pact Bismarck signed was a defensive one made in order to defend Germany was the Triple Alliance (1882). Such alliance included Austria, Hungary and Italy. It was unusual for Italy to join a pact that included Austria. However, it did so because of several reasons including the fact that (I) France was occupying Tunis, (II) Austria had promised Italy territorial concessions in case of victory in the Balkans, and (III) Pope Leo XIII was seeking Europe’s help in order to reestablish his authority of the Papal States. Austria’s relation with Russia was tense because of the Balkans, and during that time, Bismarck maintained the diplomatic pact between the countries, and stipulated a secret agreement with the Russian Tsar Alexander III, the Reinsurance Treaty which established that: Germany would have not joined Austria in case of an attack against Russia, and Russia would have not joined France in case of an attack on Germany. Bismarck was removed from his post because in Europe was rising a stronger desire for colonial expansion, and Bismarck was too diplomatic for the German Foreign Policy that wished to expand its domain across the continent. However, when Wilhelm II ascended to Russia’s throne, the Reinsurance Treaty was discarded by the new sovereign. In the meantime, the United Kingdom had requested an alliance with Germany which was never achieved since Britain ‘did not agree with their ideological and military goals’ (New World Encyclopaedia 2015). Due to Germany’s aggressive policies, France and Russia started collaborating with each other with simple agreements, and subsequently, in 1892, established the Franco-Russian Alliance. Meanwhile, the British and the French signed the Entente Cordiale in 1904, and when Russia joined in 1907 it became Triple Entente. What were the relations between France- Britain – Russia before the Entente? Before delving into the details of what the entente is about, it is necessary to underline that treaties and alliances were being signed ‘between individual countries all over Europe’. For instance, The Treaty of London (1867) – which stated that Britain would intervene if Belgium’s neutrality during a European conflict was threatened; Italy and France had secretly signed a pact of non-aggression; Russia agreed to protect Serbia..and so on and so forth. All European nations were afraid of Germany’s expansionist ambitions. However, all the treaties mentioned above would become devoid of any meaning on July 1914, when the First World War started in Europe (BBC 2014). Throughout history, the three countries had been rivals for several different reasons, and – at times – for extended periods of time. For example, France and Russia had fought against each other during the Napoleonic wars and campaigns…France and Britain fought the Hundred Years’ War (and several other wars)…Russia and Britain did not sympathise with Japan – who had won the war against Russia in 1904…Moreover, as all this competition was not sufficient, these countries had colonial ambitions and were striving to get control over the territories in Africa, Asia and the Middle East (BBC 2014). However, Russia, Britain, and France had not always been on friendly terms, and it was Sir Edward Grey that instituted such entente which did not require any of the participants to go into war in case one of them was attacked. Simply, they had the duty and ‘moral obligation to support each other’ (BBC 2014). A decade before the First World War, on April 8, 1904, France and Britain end their ‘long-standing colonial disputes’ over territories in Nord Africa. The initial name of their agreement was a Declaration between the United Kingdom and France Respecting Egypt and Morocco, and according to it, the two European powers should not ‘challenge’ the ‘British control over Egypt’ and guaranteed France the right to implement any government, economic, and military reforms in Morocco, as well as their right to ‘preserve order and to provide assistance’ (History 2009). France’s main reason for having diplomatic relations with Great Britain was its necessity to defend itself from Germany after its victory in the Franco-Prussian war. Moreover, Britain’s reason for allying with the French originated in their fear of being attacked by Germany that was developing an ‘ambitious naval program’ that threatened the British one (History 2009). Germany’s first attempt to break the British-French alliance was in March 1905, when the Germans sent Kaiser Wilhelm II to Morocco in order to ‘support the sultan’ against the French government (History 2009). However, such a move strengthened the French control in the region since during a conference held in Algeciras (Spain), ‘France’s claims on the region were recognised’ (History 2009). Yet, the situation was unresolved, and the ‘clash’ between the two European powers caused the First Moroccan Crisis (1905) and the Second Moroccan Crisis (1911) (History 2009). It is no surprise if France and England only strengthened their alliance after witnessing Germany’s aggressive colonialists behaviours. For this reason, the Cordial Entente went from being a ‘mere friendship to an informal military alliance and, later, to talks and an agreement with France’s ally, Russia’ (History 2009). The situation during the Entente consisted of the British Empire, the Russian Empire and France with its colonies, controlling a vast territory which summed up to 70 million km2. Therefore, their domain extended over half of the habitable territories of the world which comprised a population of over 600 million people. In 1904, Britain and Russia thought it was time for France to exit the period of ‘splendid isolation’ that Bismarck’s Germany had placed her in (BBC 2014). Therefore France joined the Entente Cordiale (which signifies Friendly Agreement). Before Russia entered the agreement with the other two countries of the Entente, it is necessary to note that France and Russia had been opponents during the Crimean War (1853-1856). However, also Russia ‘sought reassurance’ against the Germans who were attracted by the idea of expanding towards the East (Military History 2018). Yet, Russia was not only seeking to defend herself from potential conflicts; it also had to deal with major interior struggles: in fact, it was ‘the most backward of European powers’ and was struggling with ‘an oppressive economic system [which caused] resentment among the poor and peasant classes’ (Military History 2018). In 1912, two years before the war broke out, ‘two powerful hostile blocks had been formed in Europe’: on the one side stood France, Britain and Russia, whereas on the other side stood ‘an increasingly isolated Germany with relatively lukewarm support from Austria-Hungary and Italy’ (History 2009). In 1914, the Archduke Franz Ferdinand (the heir to the Habsburg throne and the Austro-Hungarian Empire) and his wife were assassinated by the Bosnian Serb Gavrilo Princip. Although ‘no one in Austria-Hungary’s government was particularly upset by Franz Ferdinand’s death’ (since from that moment on he was not going to cause any ‘constitutional problems’), the attack was nonetheless an excuse to start a war against Serbia (Wilde 2018). 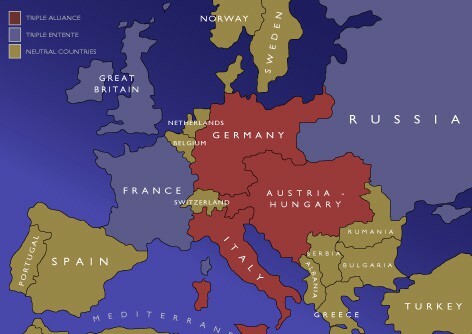 When the First World War started, Europe was divided in two powerful blocks. The United Kingdom, France and Russia (also known as Triple Entente), was opposing Germany, Austria-Hungary and Italy (also known as Triple Alliance. Although Italy had been a member of the Triple Alliance since 1882, it ended up switching sides and joining the Triple Entente. A reason for such a switch includes Italy’s ambiguous feelings towards the Austro-Hungarian Empire, which had conquered territories that previously belonged to Italy. Therefore Italian nationalists wanted to re-obtain them. Moreover, when Italy joined the Triple Alliance, not only did it claim not to want to enter any war against Great Britain, but also made a secret pact with France in 1902 in which it stated it would not attack France under any circumstances. However, in 1914, Italy decided to remain neutral on the basis that both Germany and Austria-Hungary had not been attacked: rather, they had respectively attacked France and Serbia out of their own initiative. On April 26, 1915, Italy secretly signs the Treaty of London, which is an agreement with the Triple Entente that established Italy’s imminent attack on the Central Powers. Therefore, on May 3, 1915, Italy abandons the Triple Alliance; and on May 23, they declare war on the Austro-Hungarian Empire. [4.] Military History (2018). Russia in WWI’s Triple Entente. [online] Warfare History Network.